Steve Conley is the head coach at Methodist University, a D3 School in Fayettville, North Carolina. The Methodist University golf team has made 23 consecutive appearances in the NCAA D3 National Golf Championships, winning 11 championships including 2015, and finished in the top 5 in the nation for the past 17 years. The team’s success stems from the fact that the school is one of a select few (19 schools) that offer a PGA Professional Golf Management Program. This program leads to a Bachelor of Science degree in Business Administration or Marketing with a concentration in Professional Golf Management and is one of the reasons why top golfers throughout the country seek admission to Methodist University. There is a little history between Methodist University and myself. In 1990 when I was a strapping young junior golfer, I received a recruiting package from Methodist University and coach Conley. Because I was naïve and uneducated in the recruiting process and had never heard of Methodist University, I didn’t give the package much of a look or return the recruiting survey. The moral of the story is, forget what you know about college and check out each and every program on your own. Many students gravitate to schools they have heard of for no particular reason and don’t give lesser-known schools a chance. Do you have a set number of states you actively recruit in, or do you have the ability to recruit any player in the country? We have the ability to recruit any player in the country. Players east of the Mississippi are the players that have probably heard of Methodist University and are familiar with our golf program already. We do have students from 40 states that are in our PGM program. While I don’t focus on one particular area, I would say that the north and northeast is where I recruit more. Do you find a lot of high school players who just want to play D1 or think they can play D1? Yes, everyone thinks they are D1 material, and there are some weaker D1 programs where they might be able to get a scholarship or some scholarship money, but they don’t consider D2 or D3 programs because they have D1 on the brain. What are some important recruiting concepts that parents and students you meet with don’t have a grasp of? Has the growth of the Internet had any effect on your job? Yes, I get a lot of emails and it has broadened the scope of recruiting. I make less phone calls because I am returning more emails. I like email sometimes because I can do it at any time of the day. The killer is when I am communicating with a kid both with the phone and through email. There have always been recruiting services, but in the last several years the number of online services has really grown. Do you use any of these services to search for potential recruits? I haven’t really used these because I have so much volume to deal with already with letters, emails, videos, and phone calls from parents, coaches and recruits. I simply don’t have time and would rather spend my time corresponding with kids that show an active interest in our program and that contacted me directly. 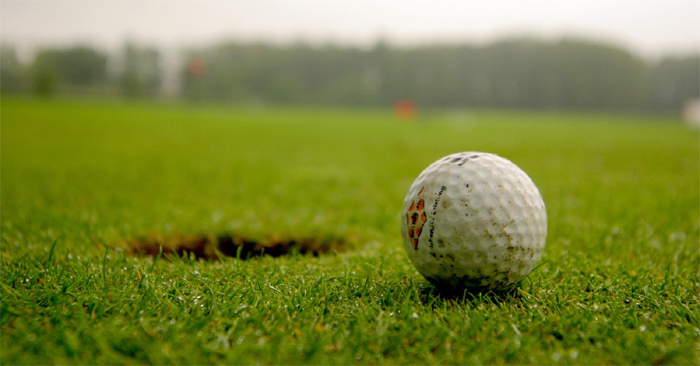 Have you heard of the junior golf showcase, which is an online golf site for high school golfers run by the Golf Coaches Association of America? Yes, it’s a great tool but same answer as above, no time and little need. I deal with players I know vs. the unknown. How many high school golfers would you say contact you on their own each year. How many do you contact, either via phone or letter? Everyone is treated as a recruit, and I don’t spend a lot of time seeing high school golfers play or attending tournaments. Do you think your program often gets overlooked because you cannot offer athletic scholarship aid? Absolutely, but like I said, we might offer a better academic and financial aid package than what you might get for a golf scholarship at a D1 or D1 school. Do you find that you have to sell your program more or are recruits more eager to come to your program given its success? Years ago, we used to have to sell our program hard because of we are a small school. Because of our tradition, reputation, PGM program and facilities, I don’t have to sell that hard any more. We have an 18-hole golf course and a driving range on campus, so that is pretty attractive to recruits. Do you run any summer camps or clinics? A few camps in the summer. I occasionally recruit players that attend the camp, but the camp is mostly for local players to learn the game of golf. Do you find many parents and students who started the recruiting process too late? Yes. It’s gotten better but there are those that are still behind. We only have 100 spots in our PGM program and there are only 14 schools in the country that offer it, so it’s encouraged to get into this program early. We have an early admittance program of Nov 1st, which a lot of students aim for. Do you receive videos from players? Yes a fare share and that is nice. However, some are low quality or have bad angles. I like to see a straight on golf swing or directly behind the golfer from a reasonable distance, not too far, not too close, and you have to use a tripod and turn the microphone off! A video is better than nothing but you have to do it right. I get videos with kids missing 8 out of 10 putts from 5 feet from the hole, which can be funny at times. Either show the stroke or show yourself making putts! Do you have any programs in place to help incoming freshman adjust to the college environment? We have a freshman orientation course like most schools would have. We also have a PGM staff member who teaches just PGM freshman and he is their counselor and advisor. Given that golf scores are tangible numbers that can be evaluated (unlike a batting average), do you find it easier to recruit players and have confidence in the ability of players you bring into your program. I look for qualifiers such as: (1) average score as a starting point, (2) where the player lives and competes, (3) competition they play against. I respect winning at any level, however there is overlap. Location gets factored in with their schedule, where do they play, who do they play against. I ask what their competitive scoring average is for tournaments in a given summer and most kids tell me their handicap, then I ask the same question again and restate what kind of answer I want. I want to know what your stroke average was for all the tournament rounds you played in a given summer, which we all know is going to be much different than a handicap. It seems like every kid I meet with tells me he has a 1 handicap. Do you find high school coaches willing to assist players in their recruiting efforts? Yes, this has gotten better. A few coaches this week called me and some email me. The ones who take their responsibility seriously are on the ball, while there is always those who don’t really try to help their kids. At the peak of your recruiting efforts, how many players might you be evaluating? We have open tryouts so it’s hard to answer. We have a list but I don’t have a specific number. I recruit anyone interested in our program that I think can be accepted here and can play golf here. We might have 25 kids who are the most talented recruits, but that changes by the day as kids make their own decisions as to what schools they want to pursue. I try to keep my numbers reasonable, but I don’t have a big board with 200 names on it every year, like some other schools might. A student’s ability to communicate with a coach via phone and letters shows a certain level of maturity, do you agree? Yes I do. I can always tell a players maturity level if their mom or dad are making all the phone calls and doing all the emails. There are parents that meet with me that won’t let their kid get a word in when they visit. Do you have any walk-on’s or walk-on tryouts. We have two tryouts each year – fall and spring. I carry 15 players on the team, so we usually have 9-10 spots on the team in the fall to go with about 5 returning players. Tryouts are a 72-hole tournament and we take the top 10 to join the 5 returning players. Then we have tryouts to see who travels to tournaments, and each is different. Do you communicate with other coaches when it comes to players you are recruiting, meaning players who are interested in your school, but might not be a good fit or might not be able to get in academically and vice versa? Other schools communicate with me. But I don’t do a lot of communications with other schools. Some large schools call me about kids who they think need to attend a smaller school. Some D3 schools call me to tell me about kids who are looking for a PGM program. It seems that only certain coaches recruited back then and now all recruit and all coaches have to recruit and everyone sends letters and call kids and email kids. It’s popular to recruit now. Do you receive any recruiting packages from 3rd party athletic marketing services? Yes, I glance at them or speed read. I look for SAT, GPA, handicap or scoring average. We have gotten some players through recruiting services. Do you see the majority of the players you recruit play in person? NO. I don’t really need to and I don’t always have time so I don’t get to a lot of tournaments. Is a basic cover letter, athletic resume and a recommendation enough to get the ball rolling in the recruiting process? Do you think many students who contact you underestimate the strength of your golf program because “it’s D3”? Absolutely, they usually underestimate the skill of our team and program and overestimate their skill. Do you think the majority of your players could play at a top D1 golf program had they chosen that route? I have had some players that good, but not all. I think all of my players could play at the D1 but top D1 golf programs have players that are extremely talented. Your school offers a professional golf management program. Would you say this program contributes to the success of your golf program by being able to get top recruits? Yes it does. The PGM program goes hand in hand with our golf program and both lead to our success. The PGM program allows me to recruit talented golfers. Are all of your players involved in the PGM program? This program requires a student to be able to pass the PGA playability test, can you outline what that means exactly. First you have to play a 36-hole round based on course rating plus 15 strokes. You have to pass that test once before you graduate. Then there are 3 checkpoints for standardized exams. The PGA administers those tests at the school. It helps. The big schools won’t really look at you if you are not playing AJGA tournaments. I however, look at a kids overall schedule. Do you find recruits who aren’t interested in your program have a difficult time actually telling you, meaning is it important to hear NO from them so you can move on to other recruits who may be interested. I can tell by a kids actions whether or not they are interested. If they don’t send me stuff back (recruiting survey) after I mail them, I stop recruiting them. I ask for actions from everything I do whether I sent a letter or make a phone call. Some kids do have a hard time saying no or saying I am looking at or going to another school. But it’s important for them to tell me if they are not interested so I can move on to other recruits and they can move on to other schools. Will you continue to correspond with a kid who has told you that they are not interested. Not usually. However, I tell every recruit to let us know if they change their mind and that they can call us. But if someone says they are not interested, I won’t invest any more of my time pursuing them. Given the strict practice rules set forth by the NCAA, do you have to be careful given that you have a golf course and range right on campus. Yes, I can’t help or watch them play out of season. The NCAA says that D3 athletic programs are supposed to have no influence on admissions or financial aid. How realistic do you think this is? We follow that to a tee. Parents ask if I can help or what I can do and I say that admissions and the financial aid office is responsible for that. We can submit names to admissions of kids that have shown an active interest in our school and golf program and admissions will give me feedback on a kids chances or what a student might need to do to gain acceptance to our school. But if you don’t have the grades or test scores, it is out of my hands.